The Special Libraries Association is a nonprofit global organization for innovative information professionals in business, government, academic, and other specialized settings. SLA promotes and strengthens its members through learning, networking, and community building initiatives. SLA provides lots of networking opportunities that can help shape one’s career. They are one of 3 organizations that plan an annual conference for information professionals here in Montreal called the Congrès des professionels de l’information (CPI). As members, we have access to one full day, free of charge. SLA has a growing online community that is more than willing to help out when one’s in need. Also, being a member of SLA gives you potential access to webinars and resources in various domains, such as Taxonomy and Information Technology. Last year, we saw success with the Ottawa trip organized with ABQLA. We also had fun organizing a Murder Mystery party with ABQLA. We ensure that our events are educational for students and fun! This year, we’ve invited a Knowledge Management Content Specialist to come talk about the Canadian Association of Law Libraries and how it can help build a career. She will also talk about law librarianship and how to get into it. Because of last year’s success, we were also thinking of planning another Murder Mystery party. Interested in librarianship, children, or children’s librarianship? The Multilingual Children’s Library is a student-run library that does collection development, cataloguing, and storytimes around campus in partnership with SSMU and PGSS. It is the only SIS student group that deals with children’s/youth librarianship, so it is a great opportunity to explore a side of librarianship that’s not covered by the coursework. MCL is starting fresh this year after a two-year hiatus, so it’s a great time to get involved and help cultivate a new club. This year, we are also hoping to host a social event and meetings with professionals in the field. Librarians Without Borders is a non-profit organization that strives to improve access to information resources regardless of language, geography, or religion, by forming partnerships with community organizations in developing regions. By joining LWB, students have the opportunity to not only help the local Montreal community through involvement with the Native Friendship Centre, but also contribute to the national Librarians Without Borders initiatives in Guatemala and Haiti. It has been rewarding to be apart of an international organization that focuses on literacy throughout the world. The LWB Social at the beginning of the year is always a big success. We also held a bake sale on the second semester that was very successful. Finally, we finished cataloguing the small library of the Kativik school board, which had been an ongoing project for the past years. The LWB Social is coming up at the end of September. The tentative date is Friday, Sept. 22nd. We are also working on creating a partnership with Cite Soleil in Haiti to assist with the development of a French and Creole book collection. 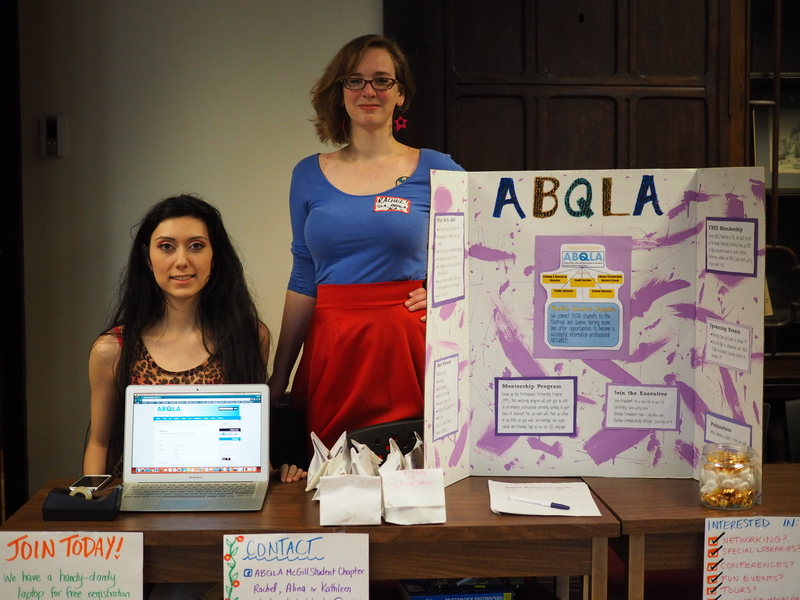 ABQLA is about connecting students with the parent chapter and introducing them to the awesome libraries that are present in Quebec. Most specifically its public libraries, but the parent chapter also focuses on, but is not limited to, academic, school and research libraries. It’s a great opportunity to network! While we don’t host any large colloquiums like ACA and AMIA, we do participate in the parent chapter activities, like the Fall Meet and Greet (Date TBA!) and tours that the chapter hosts. The ABQLA Student Chapter also helps organize the mentorship program which connects students with a professional working in the field who can answer questions or provide advice to the student regarding their career path. I mainly joined because it seemed like a good way to get involved and stay up to date on what was going on in the field. The Mentorship program was a success! We hosted a Meet and Greet night for mentors and mentees to meet in a relaxed social setting. We had at least 40 people arrived at the SIS Mansion to partake in this evening 5 a 7. We also successfully co-hosted our second annual Murder Mystery Night with SLA in the winter semester. Students signed up and were assigned a fairytale character and had to figure out who had killed off Rose Red before the evening was over. This year we are planning to continue the success of the mentorship program and murder mystery night but also hope to plan one or two tours to interesting libraries/information centres in the Montreal area. Notably, we are thinking about going over to the Montreal LGBTQ+ Community Centre to talk to them about their library and initiatives. 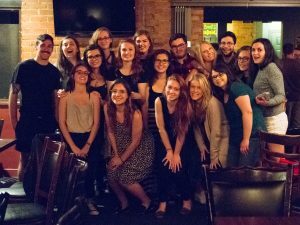 The McGill student chapter of the ACA aims to introduce student archivists to the profession by enhancing educational engagement. This is done by promoting communication between students, student members, regular members, and community professionals as well as by organizing activities and events designed for the development of knowledge and skills. The ACA offers a ton of extra-curricular activities that help you gain skills, make network connections, or build up your CV! We will be hosting a series of activities and events this year, including tours (such as Artexte, which will be on September 23 @2pm) which we are hoping to host at least 4 of this year, and our annual student Colloquium in the winter. If you decide to also register with the parent chapter, they host a mentor-ship program that joins student archivist with working professionals. Last winter we hosted our 10th Annual Student Colloquium titled “First People, First Records, First Voices”, which featured professional presenters from Michelle Smith a First Nation Film maker, Sonia Smith from The Truth and Reconciliation Library Committee, and Beth Greenhorn and Alexandra Haggert from Library and Archives Canada Project Naming. We have a series of tours planned for this year at local Montreal Archives (Artexte on Sept 23 @ 2pm), for students to learn about different archives, and types of material holdings, as well as meet professionals and start developing their network connections. We will be hosting our 11th Annual Colloquium this year, and by becoming a member you can help us choose this year’s theme. The Association of Moving Image Archivists McGill Student chapter seeks to familiarize student members with the most urgent issues of conservation, preservation, and access for image, audio, and moving image archival holdings, while also helping them create connections and contacts with scholars, other students, and professionals. 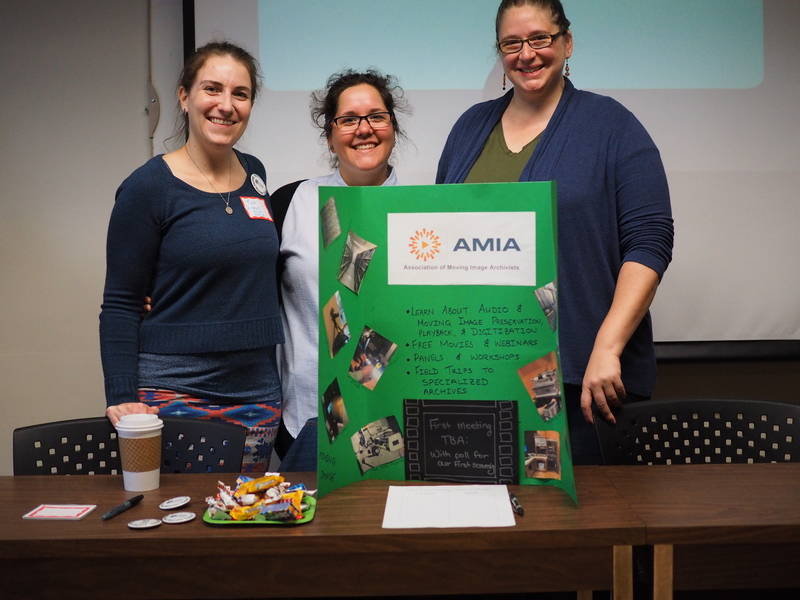 AMIA offers a ton of extra-curricular activities that help you gain skills, make network connections, or build up your CV! We will be hosting tours this year to archives with image, audio, and moving image holdings. We will also be airing webinars on important topics hosted by our parent chapter, as well as setting up workshops to learn practical skills such as how to set up a reel-to-reel projector. We screen films and movies at our meetings, which can be a fun break from school work. Our annual Symposium is held in the winter semester, and features student and professional speakers on topics related to archival practices of image, audio, and moving image. Our 2017 Symposium was a huge success! We had seven students present on a variety of topics from Digitizing Areal Photographs to Preserving Memes for Digital Folklore. An excellent professional panel was assembled and featured guests from McGill Library and Archives, Archive Montreal, Canada’s National History Society, and Radio Canada. We are setting up tours to Cinemathique Canadienne, and the Audio Visual Archive at Marvin Duchow Music Library. We will be hosting a workshop on loading reel-to-reel projectors, as well as set up a group to volunteer at Family Movie Day hosted by Archive Montreal (ArcMtl), which is a day to air home movies for people who don’t own the playback equipment needed to watch on their own. Students should join if they’re interested in tech in any way, regardless of experience or education. We’re looking to learn and teach together to become more comfortable and effective with how we use technology. Last year, we had a few workshops or guest speakers, as well as movie bingo for the 1995 film “Hackers”. We’re looking to do some coding workshops around Python and several members of MISTech will be directing the 617 tutorials. We’re hoping that potential events and projects will be generated by curious members and we’ll act as a support and learning network to help make those a reality. InfoNexus is a conference organized by MISt students that gives the chance to students to hear about professionals in the field and about the various types of careers that our degree may lead to. It is an opportunity for students to ask questions to professionals that have been in our shoes. Students should volunteer for InfoNexus because it offers many networking opportunities. It also gives students experience in management, grant writing, and web design. Last year, we had a great turnout with over 70 attendees. In addition to McGill, we had students from John Abbott as well as from UdeM listen to the enthusiastic speakers from various domains. It was refreshing to see so many people participate and ask their burning questions. This year, we intend on finding speakers who can introduce our students to job opportunities we wouldn’t necessarily think of. Information professionals can find jobs in many different areas, and it is for this reason that we intend on finding out what other career opportunities are out there. Published by Coady Sidley on September 22, 2017 at 9:47 am under News from Student Groups, SIS Student Life. 1 comment.